The significance of Dubai as a business hub is indisputable. The emirate provides one of the world’s best opportunities for foreign investors. 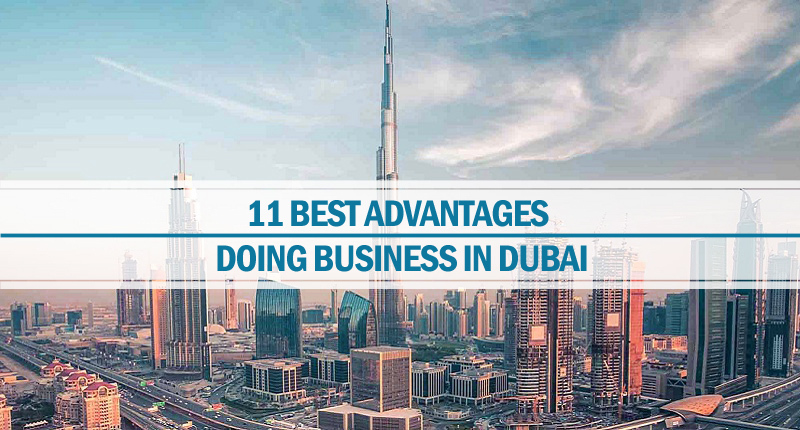 In this aspect, Dubai is not only the best in UAE and the Middle East, but it also surpasses several other cities around the world that are known for their business friendly processes. We can find numerous advantages for setting up business in Dubai. These advantages are available for local as well as foreign investors. Following are most important and evident benefits that attract investors and entrepreneurs from all over globe. No entrepreneur or investor wants to invest money in a place with poor law & order situation. Investors are facing this issue even in several world-class business centers in Europe and North America. But there is nothing to worry in Dubai regarding security and safety. UAE as a whole has very low rate for all types of crimes and Dubai is one of the best in this regard. The level of different types of crimes is very low that makes entrepreneurs and residents feel safe alike. It is an important reason that several small and large businesses (including many multinational companies) have their presence in Dubai and their numbers are increasing continuously with the passage of time. As compared to most of the countries in the Middle East, UAE has quite friendly attitude towards foreigners. It is especially obvious for foreign investors. There are several foreign investors that are permanently residing in Dubai due to security, quality of life and caring government. Now, it has become easier for those investors to make Dubai their second home as UAE has announced to provide 10-year residence visa to investors and professionals. The real beneficiary of this order is Dubai as it hosts most number of investors and professionals. The visa process is also simple and quick that will attract more investors. A major step that Dubai is taking for benefit of businesses is providing them all types of marketing opportunities. One such important marketing technique is the organization of various events and exhibitions throughout the year. These exhibitions are not confined to one or few types of business activities but they encompass variety of businesses. These include fashion & beauty, education, auto, real estate and several other industries. These events are held in different parts of UAE but Dubai hosts around 80% of them. These events and exhibitions provide exposure to businesses not only in front of people from UAE or Middle East but also from different parts of the world. It is due to the presence of large number of expat population along with arrival of millions of tourists in Dubai every year. Just single type of business area creates stiff competition for new businesses. In order to provide full opportunities to emerging businesses, the government of Dubai is providing business setup opportunities for foreign investors in various free zones also. These investors have several advantages in these free zones as foreigners can own 100% of their companies (foreign companies in Dubai mainland have 49% of shares). There are around 45 free zones in UAE while more than half of these are in Dubai. Most of them are tax free and also been exempted form newly-implemented VAT (value added tax). There are several fee zones here exclusive for a specific type of business activity (e.g. Dubai healthcare city for healthcare industry) while others are open to all types of businesses. Dubai hosts several world renowned free zones including JAFZA – world’s largest free zone and DMCC – world’s best free zone. These free zones are mostly present near seashore and provide best opportunities for import, export and re-export business activities. The government of Dubai is not only providing facilities to large investors but it is also friendly towards small and medium businesses. The government is always ready to take suggestions from all types of businesses and take decisions after taking an account of the problems of various sectors. There are different rules and regulations for various businesses according to their requirements and the burden that they can carry. The government also announces incentives for particular types of businesses from time to time in order to support all business sectors. Wealth of population plays important role in growth of any business and it is an important reason for flourishing of businesses here. Dubai has wealthy local and foreign population. Both citizens and expats have high income. They can easily afford to buy products and use services that are present in a big city. This provides big opportunities for multinational companies. Apart from that, there is lot of business opportunities for small and medium sized businesses as well. It is due to the presence of large number of labourers from low income countries. Another important feature that increases chances of growth of several types of businesses is the arrival of large number of tourists in Dubai. Millions of tourists visit Dubai every year for entertainment, medical or other purposes. It provides growth opportunities for businesses like hotels, entertainment, healthcare and many others. Dubai is also trying to increase number of tourists through several new projects. Their aim is to increase number of visitors in summer season also. It is expected that further increase in tourism will provide more benefit to several industries. The government of Dubai is quickly following latest technology for providing best facilities to its residents and makes smart changes in government institutes. For this purpose, Dubai is taking several initiatives to attract tech companies including the adoption of knowledge-based economy and others. There are also few free zones catering needs of companies related to latest technology. These initiatives provide good opportunities for tech-based companies and they are also growing in the emirate of Dubai. The large sophisticated population of Dubai has increased quality of life for the city. Most of the people dine outside while many among these are ready to buy expensive items and use such services to attain better health, look beautiful and enjoy their life. This is also an important factor that grows several expensive industries including fashion & beauty, skin treatment, restaurants, gold and businesses related to imported items. This is also an important factor that foreign investors like to stay with their families in Dubai. Another very big advantage available for all types of businesses in Dubai is the presence of world’s most famous seaports and airports. Dubai-based airline (Emirates) is also one of the best in the world. This provides very good facility for companies. They can import and export products between Dubai and other important cities in different parts of world conveniently. Many countries impose restrictions on foreign businesses and it is mandatory for them to retain some part of their capital and profits inside the host country. But there is no such compulsion in Dubai. All types of businesses in Dubai mainland and any of several free zones are allowed 100% repatriation of their capital and profits.